The lives of dogs in the wild give powerful clues for the ingredients of a healthy, happy, balanced life for your pet. Dogs live in many habitats, including prairies, deserts, grasslands, forests, rain forests, coastal regions and arctic zones. Dogs are highly adaptable, yet some evolved for specific environments, such as breeds that developed heavy coats to withstand freezing climates. Aside from these differences, dogs' needs for food, shelter, exercise and social interaction are universal. The reasons why your dog likes to lean against you, chase things and curl up in a dog bed stem from her nature as a pack animal. The habitats and lives of the world's remaining wild dogs offer glimpses into how dogs live on their own. Their environment determines available food. Dingos have lived in Australia for 3,000 years and probably originated in Asia. They're carnivores and also will eat fruit and plants. Dingos hunt alone and cooperatively, catching lizards, small mammals and birds. Coyotes originally lived in deserts and prairies but have adapted to forests and mountains and even cities. Coyotes eat small mammals, reptiles, frogs, snakes, insects, fish and deer. They'll also eat fruit, grass and dead animals. To improve their hunting success they band together during the autumn and winter. Like coyotes, domestic dogs are omnivores and most depend on humans for food. Dogs adapted to most climates such as arid, tropical and below freezing, depending on the breed and where the breed originated. Dogs don't live in dens, although wolves raise their young in dens for protection for the first weeks of their lives. Pregnant pet dogs often paw at bedding and other materials to create a nest before giving birth; many dogs enjoy burrowing under covers or sleeping in snug places such as a closet or a dog bed with sides that surround her. A dog house or even a large box indoors gives your dog a sense of enclosure and refuge. In their natural environment, dogs are lean, fast and strong. Whether the dog lives in a forest, prairie, desert, mountain or coastal habitat, he's got to eat. His keen sense of smell finds prey, and he's got to be able to catch it, or he'll starve. Domestication may have come about as some wolves shifted from fending for themselves to living near humans and foraging in their garbage -- and eventually being fed. Excess calories from table scraps and treats, especially when combined with too little exercise, undermines a dog's fitness and longevity. Give your dog the exhilaration of running for his food: Take him on runs before meals. Play catch and throw sticks or disks for him to retrieve. 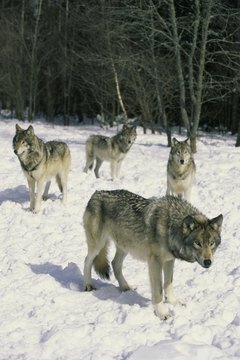 Wolves aren't the only relatives who have well-organized societies. Wild dogs of Africa are called painted wolves for their coats splotched with multiple colors. Packs of up to 20 of these Cape hunting dogs bring down antelope and even the enormous wildebeest. A monogamous pair heads each pack, which cares for the lead female's pups. Due to human expansion into their habitats and diseases from domesticated animals, these highly cooperative dogs are under threat of extinction. Domesticated dogs crave communication through the same means pack animals use: touch, gestures, vocalizations and interaction. Your dog enjoys hearing your voice, being petted, being in physical contact with you and being included in your activities. Dogs don't like being left alone for hours; it's hard for them to be isolated because of their sociable natures.